Outdoor patio tile requires a lot of understanding about your climate, and what's beneath the tiles. Improper materials or installation could result in cracked tiles in just one season. If you are considering tiling your patio, make sure you consider where you live and the age of your concrete before you make your selection. The first thing you need to consider when tiling your patio is the weather. If you live in a climate that is warm year round and not subject to frost heaves or the freeze/thaw effect, you can use any tile or material that you'd like. If you do live in an area subject to frost heaves, or where the ground freezes in the winter, you're going to be more limited in your choices. Some types of tile, like natural stone or terra cotta, are porous. This means their surface is covered in millions of tiny holes, many of which may be invisible to the naked eye. When water collects in these tiny holes and freezes, the water expands potentially, cracking your tiles. Over time, this constant expansion and contraction will break your tiles apart. Thicker tiles, such as bluestone slabs, are less likely to crack in this way, but are more difficult to install. To ensure your tiles are unlikely to crack, and can be installed over any surface, look for the following information. Ask for the water absorption rate of the tiles. Some types of quarry pavers can give you the look of terra cotta with very low water absorption of less than one percent. The lower the water absorption rate, the less likely the tiles are to crack during the winter. Any tile that has been vitrified has an extremely low absorption rate, and is one of the densest and most durable products on the market. Vitrified tiles are created by compressing dry clay dust into a mold before firing. Since there was no water in the makeup and the tiles were compressed under tremendous pressure there is virtually nowhere for the water to go. Vitrified tiles can mimic the look of slate, granite, marble or even leather and fabric so you can get the look you want without the worry. If your concrete is fresh, or if you've recently had it patched and leveled, you'll want to pay close attention to the expansion seams. Fresh concrete will expand and contract as it cures, so seams are put in place to allow it to do so. If you place a tile directly on top of a seam, and the concrete moves, your tile may crack. To prevent this, either wait until your concrete is fully cured, which may take up to a year depending on the type of concrete used, or use tiles that can be fit between the seams. Once you've selected your outdoor patio tile, make sure you have the proper setting materials and a nice level surface on which to work. The more uneven your surface, the smaller your tiles will need to be. So use a concrete leveler if you have dips and valleys where you will be installing the tile. Tri-sodium phosphate should be used to clean your concrete before you install the tiles. This will remove oil, grease and other types of build up, particularly if your patio has been left to cure or age before you begin tiling. You can use a thinset mortar on your patio, but make sure that it's rated for outdoor use. Two types of mortar that work well in all climates are Laticrete 272 and Keralastic. Pay attention to the type of trowel you use as well; the larger the tile, the larger the notches on the trowel should be. 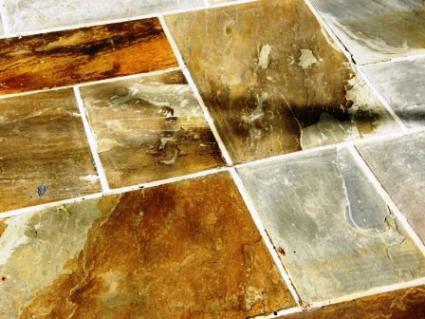 Use an epoxy grout to help your tiles flex in all weather, and to help impede the growth of mold or mildew outdoors. Epoxy grout can be harder to spread, so use a grout float to pack it between the tiles well. When you've paid attention to your climate, your concrete and your setting materials you can install any type of outdoor patio tiles you'd like. The style and design of the patio can complement the rest of your home, garden or yard while looking great. Proper material selection and installation will make sure that it looks great for years to come.